The departement of the Alpes Maritimes - Pop. : 2,400 inh. From the motorway A8 exit Cannes then towards Grasse and 9 km on the N85 (Napoléon Road). 1 Hour from Cannes or Nice. Taking the historic "Route Napoléon" is an adventure in itself. 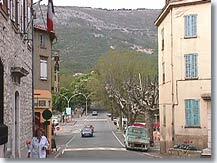 Saint-Vallier de Thiey is a stopover on this Napoleonic trail, and a very agreeable one. 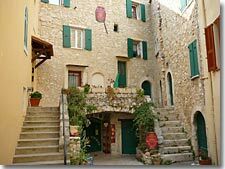 The village was a seigneury until the Revolution, then a summer climate resort made fashionable by families from Grasse in the 19th century. 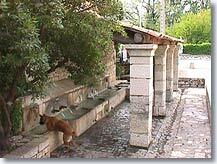 The village has many interesting features, both historical and natural. It sits on a limestone plateau beside a large verdant meadow, surrounded by medium mountains such as Montagne de Thiey (1552 m) and Plan de la Malle (1308 m), shaded by pines, oaks and beech trees. It is a bucolic village particularly attractive to those who like the outdoor life. Natural curiosities include: the natural tuff stone bridge at Ponadieu, a "druid's" stone and above all many converted caves and cavities (more than 50 in all). If you like underground mysteries you'll be in your element. If you like underground mysteries you'll be in your element. Visitors can descend 100 metres underground in the sinkholes of La Malle and La Chauve-Souris. The Baume-Obscure caves offer a very long route, 800 metres, so that's not one for the claustrophobic! 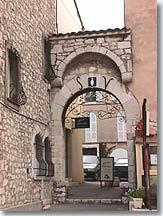 On the heritage side, Saint-Vallier has a rich historical past, from prehistoric times to the Napoleonic era. 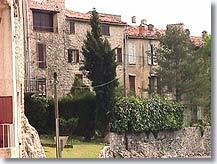 Dolmens, burial mounds and oppida can be visited at the Celto-Ligurian prehistoric camp, at Castellaras de la Malle. But the old village itself also offers some wonderful sights to those who like to nose around: a 12th century church built from beautiful iridescent dressed grey stone, superb with its square bell-tower and campanile. As you stroll along the narrow streets, after going through the old town gate carved out of the remains of the ramparts, you can admire some beautiful 15th century houses and old sheep barns, a superb polychrome marble fountain dated 1866, doors with sculpted lintels, vaulted passageways, little fountains, wash-house, etc. Saint-Vallier is proud of the fact that Napoléon passed through the village on his return from the island of Elba (1815), as indicated by the commemorative column with a Corinthian capital and a bust of the Emperor. Perhaps the locals will tell you the legend about a clever inn-keeper who took advantage of Napoleon's visit to his establishment to sell "the glass from which the Emperor drank" for a period of 20 years, and who having become wealthy deserted his village one fine morning and disappeared without a trace. Today you will not be able to drink from this famous glass, but you can spend a night at the Relais Imperial, a fine hotel with a painting on its facade showing the Emperor on horse-back. Tour of the historic centre. - Caves developed for tourism: The "souterroscope" at the Baume Obscure cave. Grotte des Audides (800 m path with life-size reconstitutions). Aven de la Malle sinkhole (350 m long ), La Chauve-Souris sinkhole. thirteen burial mounds, three pseudo-megaliths, twelve oppida. 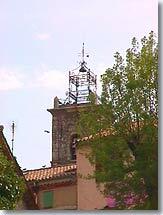 - Church of Notre-Dame de l'Assomption (12th century, previously fortified and enlarged on several occasions, particularly in the 17th century. Inside are a sculpted wooden altar piece and 17th century canvasses). - Former chapels (St John The Baptist, 17th century, Ste Luce, St Pons). - Ruins of the medieval keep of Cavagne. - Fluted column with Corinthian capital and a bust of Napoleon erected in 1869. 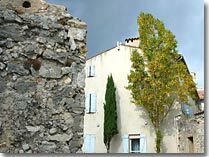 - Bastide d'Arbouin, listed historic monument (interior decoration, former bread oven, pigeon house, former ice works and lake, terraced kitchen gardens, sheep barn). - Herbarium at the Tourist Office. Pas de la Faye viewing point. Botanical trail, vivarium. Prehistoric park. Open air car show in August. Flea market and handicrafts market in August. 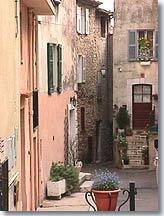 St Cézaire sur Siagne (10km), Caussols (11km), Grasse (15 km).